If you are looking for a church home, we are glad you’ve decided to look in our direction. We feel that you’ve chosen the right place – St. Mary’s Road United Church is a warm, friendly and inviting place, with a serious commitment to outreach and ministry, wonderful children’s and youth programs, thriving music programs for all ages, and so much more. This FAQ should hopefully help you learn more about who we are. If you have any additional questions, we invite you to call the church office at 204-257-0678. We hope to see you soon! We have three worship services on Sunday morning all starting at 10:15; Coffee is available from 9:30 on, and yes, you are welcome to bring a cup into the sanctuary to enjoy during the service. To find out more about our services, please visit the Tree of Life, The Journey, and Rainbow worship pages. Yes! Whether you choose to have your child attend our worship path called “The Rainbow”, or bring them to worship with you, either is fine. We do offer a range of programs for every child’s age. For newborns and children up to 2 years old a nursery area is provided that is staffed by our caring volunteers. For ages 2-4 years old, we offer a program called “Rainbow Tots” in which young children, through stories, songs, and crafts, come to understand the church as a place of care and love. For children aged 5-11, we offer worship aimed specificaly at this age group. 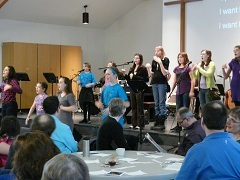 In this worship, they hear a bible story, sing, and then have a variety of centres through which they can creatively respond to what they have heard. The rainbow program was designed specifically for children of all age groups, however, all of our worship services are relaxed and comfortable, and children of all ages have always felt right at home in any service you choose! Yes! 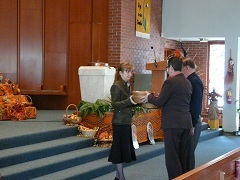 Both of our adult worship paths (the Tree of Life and the Journey) offer communion on the first Sunday of each month. Yes. We understand communion as a gift of God to all God’s people. We will tell the story of the table and if you connect to that story and spirit then you are welcome to choose to participate. At worship, as a guest/new comer, will I be made to stand up or introduce myself or be singled out in any way? No. We understand that people come to worship for many reasons. If you come to quietly connect with God we honour and celebrate that. If you are looking to connect with others we trust that will happen before and after worship at your comfort level. Do I need to give offering (money) to come? No. The offering received by the church is given by people who have chosen to commit themselves to the ministry of this community. If you are not yet at that point please know that you are still welcome to worship with us. Baptism is a celebration of faith and community. In baptism the parents of a child (or the individual him/her self) say before the worshipping community that they believe in God and in Jesus as the Christ. They commit to exploring their faith in the context of the church. If you are interested in pursuing baptism call the church office at (204) 257-0678 to arrange for a meeting with one of the ministers. I’m thinking about getting married in your church. What can you tell me about your church’s wedding requirements? For the church, wedings are opportunities to thank God for the gift of love. We would be honoured to be involved in your wedding if you share in this understanding that we are coming together in worship. The cost of the service is $600.00. No pre marriage classes are required. If you are interested in exploring the possibility of being married at St. Mary’s Road United church, please contact the church to speak to one of the ministers. Not on Sunday mornings but we do have a wide range of adult study groups throughout the week. From our Thursday night dinner/discussion group to Tuesday afternoon book club to a traditional bible study on Friday morning we hope one of these groups will speak to you. For details talk to Alice or Philip (the ministers). How else can I be involved in the congregation? St. Mary’s Road has a variety of small groups and you are welcome to participate in those of interest to you. For a complete listing or to obtain a small groups directory, please call the church office, or drop by anytime normal office hours. What does St. Mary’s Road United Church believe? As a congregation of the United Church of Canada, a good overview of our beliefs can be found on the national church’s website: http://www.united-church.ca. What we would say more briefly is that we are a community that asks lots of questions about God and faith. We strive to live more justly in the world, more gently in creation, and with greater integrity in our personal lives.